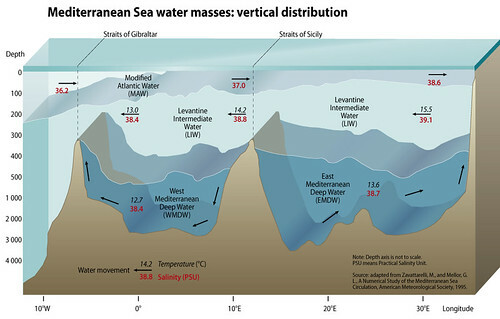 Schematically, the Mediterranean Sea comprises three main water masses (EEA and UNEP 1999): • the Modified Atlantic Water (MAW), found in the surface layer, with a thickness of 50–200 m and characterised by a salinity of 36,2 psu (practical salinity units) near Gibraltar to 38,6 psu in the Levantine basin; • the Levantine Intermediate Water (LIW), formed in the Levantine basin, lying in depth between 200 and 800 m, and characterised by temperatures of 13–15,5°C and salinity of 38,4–39,1 psu; • the Mediterranean Deep Water (MDW), formed in both the Western and Eastern basins. The Western Mediterranean Deep Water (WMDW) is characterised by a temperature of 12,7°C and a salinity of 38,4 psu, while the Eastern Mediterranean Deep Water (EMDW) is characterised by a temperature of 13,6°C and a salinity of 38,7 psu. Within the sea, the incoming Atlantic water is continuously modified by interactions with the atmosphere and mixing with older surface waters and with the waters underneath. All along its course, MAW is seasonally warmed or cooled, but overall its salt content increases and it becomes denser. In autumn, in the northern parts of both basins, MAW remains at the surface. In winter, cold and dry air masses induce marked evaporation and direct cooling of MAW, resulting in a dramatic increase in its density, which makes it sink. 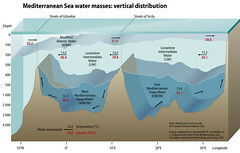 This sinking occurs in a series of specific zones, generally located in the northern parts of the basins, and is responsible for the formation of the deeper waters in the Mediterranean.